When in a playlist if I find a track I don't want I only have the option to delete it from the playlist but it remains on my phone. It would be good to have the option to remove it from the phone. I think most people who come accross a track they don't want will want to delete it entirely. I second this request. When I hear a song I no longer like, I want to be able to delete it from my device right from the playlist, not have to find the song from Tracks. Despite paying for the full version I have given up on Media monkey after reporting a few bugs and anomalies which they agreed with and said they would fix but after a year of waiting I have given up on them and gone with the free samsung app which is better and free. 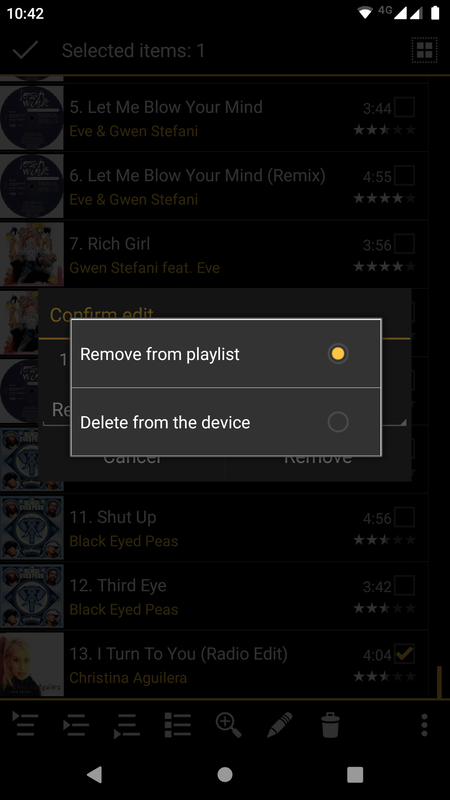 Hi deleting Tracks from Playlists is possible along with delete from device. Select any track(s) to delete (long tap) -> tap on delete icon and select delete from device also.